Argentina has cancelled a football World Cup warm-up match with Israel, apparently under pressure over Israel's treatment of Palestinians. The Israeli embassy in Argentina tweeted to confirm that the friendly, which was due to take place in Jerusalem on Saturday, had been "suspended". Israeli Prime Minister Benjamin Netanyahu called Argentina's president in an attempt to salvage the tie, but was told by Mauricio Macri that "there was nothing that I could do", Israel's Army Radio reported. Argentine Foreign Minister Jorge Faurie had said he believed his country's footballers "were not willing to play the game". "In the end, they've done right thing, and this is behind us," Higuain told ESPN. "Health and common sense come first. We felt that it wasn't right to go." 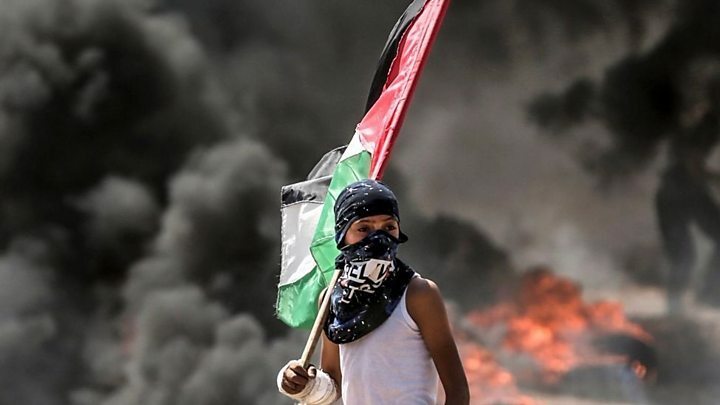 The news was met with cheers in Gaza, where at least 120 Palestinians were killed and thousands more injured by Israeli forces during recent protests. 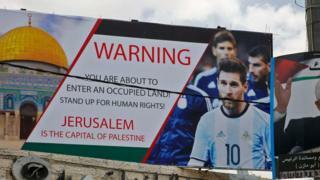 In Ramallah in the occupied West Bank, the Palestinian Football Association issued a statement thanking Argentina striker Lionel Messi and his team-mates. "What happened... is a red card from the rest of the world to Israelis," the association's president, Jibril Rajoub, told a news conference on Wednesday. Image caption At a news conference, Jibril Rajoub sat next to a sign saying: "From Palestine thank you Messi." Before the match was cancelled, Mr Rajoub had accused Israel of using it as a "political tool" and called on Palestinians to burn replica shirts bearing Messi's name and pictures of him if he played. The Israel Football Association said it viewed "with severity the physical and brutal threats, which crossed every red line, made by" Mr Rajoub. It vowed to "do everything in its power in the world football institutions to make Rajoub and the Palestinian FA accountable". The campaign group Avaaz, which had called for the game to be cancelled, praised Argentina's football team for what it called a "brave ethical decision". "This proves Argentina understands there is nothing friendly about playing in Jerusalem, when just miles away Israeli snipers are shooting unarmed protesters," spokeswoman Alice Jay said. Israel said its snipers had only opened fire in self-defence or on people trying to infiltrate its territory under cover of the protests orchestrated by the Hamas militant group, which runs Gaza. Saturday's friendly, which was to be Argentina's final game before the start of their World Cup campaign in Russia later this month, was to be played at the Teddy Kollek Stadium in West Jerusalem. The status of Jerusalem is highly sensitive. Israel regards the city as its "eternal and undivided" capital. Palestinians see the eastern part of Jerusalem - occupied by Israel in the 1967 Middle East war - as the capital of a future Palestinian state. Palestinians were angered by a decision by promoters to relocate the Argentina football game to Jerusalem from Haifa, reportedly after the Israeli government contributed funding. In December, US President Donald Trump infuriated Palestinians by recognising Jerusalem as the capital of Israel. The US embassy was moved there from Tel Aviv last month. What are the Palestinian territories?